A female rabbit, called a doe, can reach sexual maturity as early as 6 months. Rabbits procreate often as a way to perpetuate the species as they are at the bottom of the food chain and are preyed upon in the wild by many other animals. It can be hard to recognize the signs of pregnancy in a female rabbit. 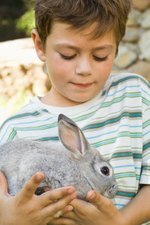 The gestation period of a female rabbit is the time of conception to the time of delivery, or kindling, of the baby rabbits, or kits. The gestation period of a doe lasts about 31 days. During the gestation period, it may be difficult to tell that your rabbit is pregnant as she may not act any differently than before she was pregnant. Some female rabbits may act more aggressive during gestation, may ward off the advances of the male and an increase in appetite may be detected. At the 21st day of the gestation period, the fetuses should be able to be detected by feeling the rabbit's stomach. The fetuses feel like marbles inside of the stomach. At around the 28th day of gestation, the female rabbit will begin nesting, or preparing a nest for the impending birth of her litter. The doe will pull her fur out to pad the nest and will push straw or hay into the nest. In captivity, the doe may hide. This can happen as little as one day before the birth. The birth of the litter of kits is called kindling. This may only last about 10 minutes from start to finish. Once the litter, usually containing seven to 13 kits, are born, the doe distances herself from the kits. This is done to protect the litter from predation in the wild. The female rabbit may eat any stillborn babies. Feeding is done twice a day and lasts only about five minutes at a time. After the litter is born, the buck, or male rabbit, should be kept away from the litter so that the babies have a better chance of survival. The buck may also try to mate with the doe immediately after she gives birth which should be avoided. The doe will feed the litter typically in the evening and only if she feels comfortable. The doe should be allowed to spend time alone with her litter to increase their chance of survival.